Have you watched the first season of The Breaks TV show on VH1? If so, we have some promising news for you. While The Breaks has not yet been cancelled or renewed for season two, VH1 has already set up a writers’ room for the second season. A 1990s hip hop business drama series on the VH1 cable channel, The Breaks stars Afton Willamson, Wood Harris, Mack Wilds, Antoine Harris, David Call, Evan Handler, Melonie Diaz, Sinqua Walls, and Ali Ahn. Season one guest stars include Tip “T.I.” Harris, Teyana Taylor, and Gloria Reuben. A sequel to last year’s TV movie, The Breaks TV series follows three young friends chasing their hip hop dreams in New York City. We are very excited about how The Breaks has been performing. We already have opened up a writers room for next season, we haven’t officially greenlighted it but everything is looking good. We also have some amazing new mini-series, historical biopics in development. That’s an area we’ve had great success with projects like CrazySexyCool: The TLC Story. It sounds to us like VH1 wants to see where a potential second season of The Breaks is going, before they give it the greenlight. That seems fair enough. The first season of The Breaks averaged a 0.57 in the 18-49 year old demo and 1.132 million viewers. While those numbers would spell cancellation on a broadcast network, for a little cable channel, they’re not bad, particularly in terms of total audience size. It would be interesting to find out how the show scores in other age demographics. In other words, how many under 18s are watching? Right now, it seems more likely than not that The Breaks will return for season two. Check out the show’s Vulture Watch page, and subscribe to receive free updates on The Breaks cancellation or renewal news. What do you think? Are you a fan of The Breaks TV show? Do you expect it to be cancelled or renewed for a second season? Let us know, below. 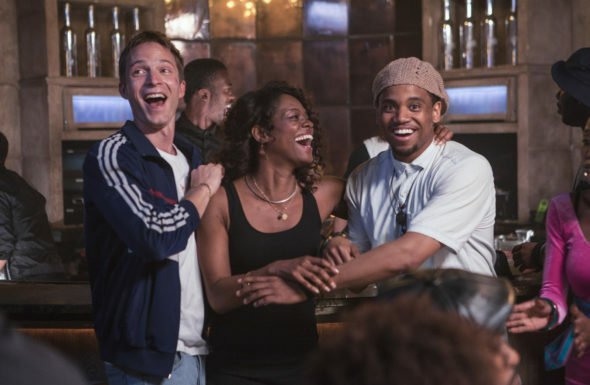 More about: The Breaks, The Breaks: canceled or renewed?, The Breaks: ratings, VH1 TV shows: canceled or renewed? Best hiphop drama show on T V. This year. Music was dope. Lyrics was dope. Love this show , was hot when I found season over,reminds me so much of eighties and nineties, Ahm and deevee is like that , I hope they end up with juggie.